The intentional infliction of a life-long debilitating disease upon an innocent person constitutes a crime in any civilized land, and yet the stupid of America inflict the lifelong debilitating disease of stupidity upon their children, making them stupid merely by procreating them. The stupid behave stupidly and thereby gravitate to crime in order to get by, and they overburden education, health care, criminal justice, and other infrastructures; additionally, to the extent government allows it, they subsist partially from welfare benefits. Sadly, no law prohibits the stupid from having a say in government. It stands to reason that immigrating and procreating the stupid without restraint will eventually make the stupid the majority of voters. They will reliably vote stupidly to elect demagogues and corrupt politicians who will rob from productive people in order to give various forms of welfare to the stupid, essentially making the productive the slaves of the non-productive. 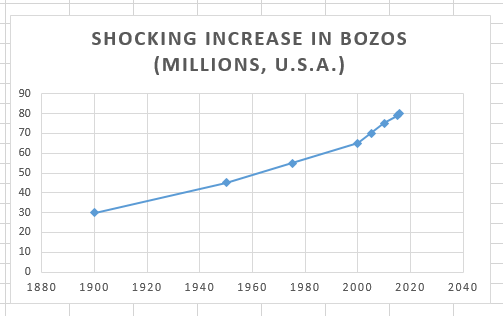 These facts portend an even more shocking increase in USA Bozos in the years to come, because of open borders, civilizationally suicidal quotas allowing the wrong people to immigrate, ridiculous welfare benefits for the stupid without imposition of any test or responsibility, and unrestrained procreation of and by the stupid out of wedlock. Rock solid border system to terminate illegal immigration. Demand these changes from your legislators under penalty of termination, UNLESS you want to witness a further SHOCKING INCREASE IN BOZOS.